Chef′s Life -What′s Your Beef? Tue, May 21 8:30 A.M.
Find out how Vivian's whole-cow program, after some initial hiccups, finds its groove. 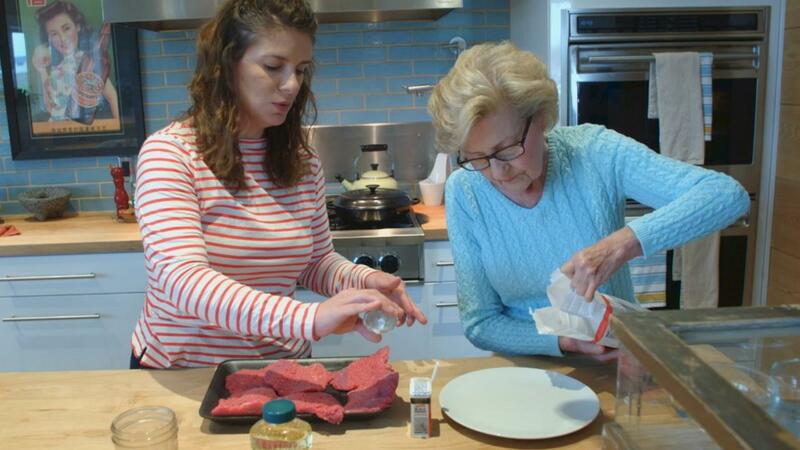 Mrs. Scarlett makes a classic cubed steak, inciting an epic tantrum from Flo. Vivian heads to New York to meet her new editor as work on her cookbook continues. Tue, May 21 8:30 A.M. what's your beef? Sun, Jun 2 12:30 A.M. what's your beef? A Chef's Life is a new food/reality series featuring Chef Vivian Howard. Vivian was making a name for herself in New York City, when her father, a hog farmer, offered to get her started in her own restaurant. The catch? It would be located in her home town, a place she swore she would never return --- the Deep South. The series plunges audiences into the kitchen of the restaurant Chef and The Farmer, a highbrow restaurant located in Kinston, NC, one of the most impoverished communities in the U.S. When Vivian arrives home, she begs local farmers to grow fennel, lemongrass and Jerusalem artichokes --- none of which are native to the region. Soon, she realizes that the cooking techniques she learned in New York could be applied to her "grandmother's ingredients," the bounty grown by local farmers. Vivian's recipes are exquisitely assembled to bring out the best in the locally grown fresh ingredients. This is real "southern cooking," anyone can implement into their own lives. Six years in, Vivian has become a pillar in this small community, with the restaurant winning accolades across the country. As the series opens, she and her husband Ben are juggling the business and raising twins, when a devastating kitchen fire destroys the restaurant overnight. What happens next is a true testament to Southern grit. All shows that begin with "C"
Sun, May 5 12:30 A.M. Honey, I'm Home!